A few days ago I got a package in the mail from the David R. Godine publishing house, who last year republished both of Russell Hoban’s hilarious Captain Najork children’s books in the US (and did a lovely job of it). Inside the package was an advance copy of the forthcoming US edition of Russ’s most recent novel Linger Awhile, which was published in the UK by Bloomsbury Publishing last year. It’s basically a story about a 1950’s black-and-white movie starlet who is brought to life from an old videotape, and becomes a sexed-up vampire cowgirl who terrorizes London for a while. As you do, in those circumstances. The US edition will be published on August 16, 2007. It’s a nice trade paperback with foldover flaps inside the covers (i.e., built-in bookmarking devices), and cover art that’s very similar in spirit to Bloomsbury’s UK edition. You can read more about it, and order advance copies on the David R. Godine Web site. For those of you who aren’t familiar with Russell Hoban, or the story of how I wound up as his semi-official Webmaster and fan club founder, I’ll fill you in on the backstory after the jump. Nine years ago, in the spring of 1998, I was learning to code HTML so I could build Web sites. I needed a learning project, so I decided to build a site devoted to one of my two favorite living authors, the American-born British novelist Russell Hoban. Russ is the author of a slew of wildly original novels including Riddley Walker, Turtle Diary, and many more, as well as the universally popular Frances the badger books for children (such as A Birthday for Frances) and the classic children’s novel The Mouse and His Child, among tons of others. And Russ is without a doubt one of the most inventive and original writers of the last century. See “Who Is Russell Hoban, and What’s His Deal, Anyway?” for more background. It’s my best attempt at describing his indescribable style, and why his books have meant so much to me over the years. Russ found out about the site very quickly and gave it his blessing, and even participated in discussions on The Kraken’s message board for a couple of years. In 2005, The Kraken organized the first-ever Russell Hoban literary convention, which was held in London, and Russ himself showed up to favor us with a reading. The Head of Orpheus will be 10 years old in 2008 (the Web site, I mean, not the actual â€” oh, you know), and it’s definitely showing its age. The design and code are both looking very 1998, there’s lots of outdated infomation about where to buy various books, and it just generally needs a massive overhaul, which I’m hoping to give it later this year. But it’s still a good central repository for a lot of info and writing about Russ and his work, and I’m proud of the role it played in helping Hoban fans find out about what he was up to in the years before the rise of Wikipedia. 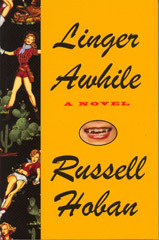 Russ has been amazingly prolific over the last decade or so, and has had a new novel out every year or two. Which brings me full circle to the release of Linger Awhile. Hoban has an active fan club called The Kraken and has inspired symposiums based on his writing. Hoban has an active fan club called The Kraken, a website dedicated to him, and has inspired symposiums based on his writing. Turtle Diary, if you’d like something poetic, wryly amusing, and deeply moving about two people who conspire to liberate sea turtles from a zoo, as an examination of the various kinds of cages we inhabit in our lives and how we try to free ourselves from them. Kleinzeit, if you’d like something larf-out-loud funny about sanity, mythology, and the creative process. The Lion of Boaz-Jachin and Jachin-Boaz, if you’d like an inventive magical-realist fantasy about reconciliation between fathers and sons, who are not incidentally stalked by imaginary lions. Riddley Walker, if you’d like a dystopian post-nuclear science fiction story about the breakdown of civilization and language, written in its own invented dialect, with cameos by Punch and the Green Man. You can turn up new or used copies of all of those, even the ones that aren’t currently in print, by searching on Amazon or Amazon UK. … or go ahead and spring for The Russell Hoban Omnibus, which includes Turtle Diary, The Lion, and a wealth of other goodies which are detailed here. I just finished my fourth Hoban novel, Come Dance with Me. He is wonderful. Sounds like you have a confirmed case of Hoban fever! Just out of curiosity, what are the other three you’ve read so far? During The Book of Grendel, I was telling Diana how much I enjoyed Riddley Walker (which I think you’d both told me to read a dozen times) but that I was having a hard time finding anything else in print. Diana was kind enough to buy me a copy of MF from some incredibly awesome online used book store that I can’t remember the name of. Then, I went to England last year for the first time, and while I was there I bought a stack that included K and CDwM. It also included the Bat Tattoo, and something else. I haven’t read those yet! I’d recommend getting Turtle Diary in there as soon as possible. It’s definitely one of Russ’s greatest achievements. If you need a copy, just let me know — I have extras. Also, if you feel like dropping 30 bucks, the Hoban Omnibus is a great thing to have and it includes four novels you haven’t read yet in one volume: Turtle, Lion, Pilgermann and Mr Rinyo-Clacton’s Offer. It’s available from Amazon — I’ve got a link to it up above.